With the rapid increase of customer interaction channels and the digital transformation imperative, customer service contact centres need to evolve to omni channel customer engagement centres, blending high-touch assisted and low-touch/un-assisted services in order to meet the needs of digitally connected mobile taxpayers. Often Taxpayer engagement is used as a synonym for either self-service or call centre functions, however, true customer experience requires a platform that allows integration between self-service, marketing, service management and the operational tax/debt collection systems. The functions should not only be highly integrated, but cover all digital and traditional channels preferred by taxpayers. 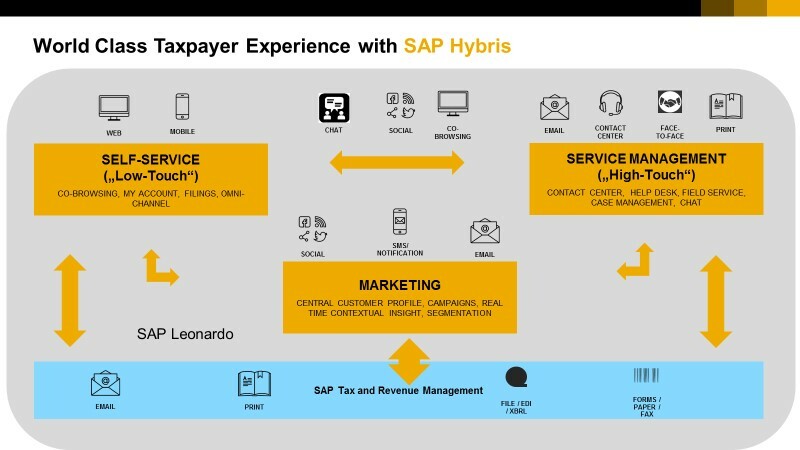 SAP Hybris delivers all of the above functions by accessing the single, central taxpayer data in the operation Tax and Revenue System and thereby allows shifting channels as required. Initiate state-of-the art dynamic web content management and responsive design that enable taxpayers to navigate their own journeys, accessing the real-time information and data they need to minimize any need to visit in person or telephone a customer service centre. Trigger personalized notifications that help constituents to stay compliant, keep on top of their tax obligations and be informed of their status with regard to overdue lodgement or payment. Respond to citizen demands for simplified and streamlined digital transactions and ‘straight-through-processing interactions, personalized to their individual needs. Hybris commerce is highly integrated with the service management component via integrated chats and co-browsing facilities. Past interactions such as simple steps on the website can be picked up and lead to an outbound marketing campaign in order to understand behaviour (such as abandoned online payments) or simply to educate the taxpayer community about new legislation or policy changes. Enables tax offices to manage and improve contact center operations by integrating inbound and outbound customer communications across multiple channels. While the service centre covers traditional channels such as telephony/IVR, video, emails, SMS, Face2Face and Field Service, it also offers chatbot technology to automate the complete or a part of the communication journey. As such, bots can work together with the service agents. As for self-services, the access and maintenance of 360 taxpayer data at the agent’s fingertip is paramount to make instant, informed decisions. In addition to master and transactional data access, decision making is also supported by context awareness and knowledge repository information (e.g. for rulings and policy information). Queue management helps organize, prioritize and routing of incoming requests across all channels. Online monitoring, control and data analysis tools improve operational decisions. The software helps you improve customer service, monitor and adjust contact centre operations in real time, lower the total cost of ownership, and build a better customer experience. While service-centre and self-service are reacting to communication events, campaign management enables operations, policy, debt and compliance department to intelligently segment your customers and initiate any type of interaction with a certain group of your customer segment. Through SAPs in-memory HANA technology, hybris marketing allows users to segment vast volumes of data directly on their operational system. Via a modern graphical user interface the system will immediately inform the user about the size and segments of the target group. Adjustments are handled real-time in a matter of seconds. Integrated, intelligent predictive analysis supports this process to learn from existing campaign execution results. Once target groups are established the campaign content and channel are defined. Here the system supports any digital outreach mechanism. It is possible to combine multiple channels and rules can be set-up to use alternatives based on customer behavior during the campaign execution. For example, it is possible to reach customers who have not read an email or have not entered a URL of an email. These customers will then be targeted with a different, alternative channel. Monitoring of the behavior during the campaign execution and the KPI-measurement of the campaign success are important to allow constant improvement in order to reach the goal of the campaign. Speed and agility from campaign planning/setup to campaign execution is of absolute paramount. SAP next generation marketing platform offers a top of class user interface which enables ease of use to set up, execute and monitor campaigns by the business rather than the IT-departments. Artificial intelligence e.g. through SAP Leonardo machine learning plays a vital role in intelligent, focused customer engagement by helping to automate and personalize the experience of the taxpayer. Simple standard self-services, routine customer calls, limited automation devices will be replaced by intelligent, prospective, personalized and empathetic, conversations with a “human-like” avatar on any device. Campaign management will foresee outcomes and as such support the selection of the right focus group for the right channel with the right message.